First, the link above… an exceptional article. What do I remember about York, PA? I lived there from 1973 to 1975, call it two years, my first two years after finishing college. Why write about this? Because I just stumbled on a Facebook post pertaining to the “York race riots” of 1968 and 1969. I lived in York for TWO YEARS, only five years later, without know anything about this calamity. Without hearing a word about two people who died (Ms Allen, named above and a police officer named Henry Schaad) and the state of war that had existed between the police and government of York and its African American citizens. HOW DID I MISS THIS? And can I learn something from it now, almost 50 years later? Why York, PA? What was I doing there? Why write about it now? First I should explain that I “finished” college with two degrees, BS in Chemistry from Michigan State University in 1971 and MS in (Analytical) Chemistry from The Pennsylvania State University in 1973. I had graduated from high school in 1967, so you can tell I went through college in a straight line, four years for the BS and two more for the MS. But most of my summers were not devoted to study. I spent two summers working as a lifeguard (easy, but long hours), three summers traveling (8 glorious months, total!) and one summer on the Penn State campus, doing the laboratory work for my MS degree. I never returned to academe as a student. Penn State was a great platform for job hunting, and 1973 was not a bad year for Chemistry graduates. I had numerous on campus interviews, traveled to visit some big name employers (like Dupont) and was invited by the Pennsylvania Department of Environmental Resources to work in its Bureau of Air Quality at a district office in York. I accepted that offer. For someone with my educational background, this was a career change, undertaken before I had a career. The first Earth Day, in 1970, while I was at Michigan State, had raised my conscious (or at least altered it) and I was less interested in the science of chemistry and more interested in its application to the problems of environmental pollution. Required, at Penn State, to choose among the traditional disciplines of Chemistry (organic, physical, analytical and inorganic), I focused on Analytical Chemistry, for two reasons. I thought I could always count on getting a job in Quality Control, somewhere. And I thought the Chemistry of pollutants would be interesting and relevant. So, at Penn State, I learned that pollution was studied by engineers, and I took a few engineering courses. Very few. Two air pollution classes, and three or four single credit seminars in water pollution and solid waste management. This meager list qualified me as an “expert” in those early days of environmental regulation. I’ve no idea why I was assigned by the Bureau of Air Quality to York. I didn’t look very closely at the City itself. The office was new, located in a shabby rental downtown, and very small. We peaked at one supervisor (very young), four air quality inspectors and two support staff. The work had nothing at all to do with chemistry, and I was on a fast learning curve. We inspected factories, reviewed emissions inventories, investigated complaints of smoke and malodors and serviced a few simple air sampling devices. We kept records when the state sent its stack testing team to our area. We testified in court when we caught a polluter in the act. It was varied and interesting, and we felt we were fighting “the good fight”. What about York? A friend of a friend was teaching at York Penn State. An apartment was available in the house where she lived. I moved in with my meager graduate student furnishings. Adult at last! What did I think about York? Well, compared to what? Suburbia? The campus of a large public university? I was decisively an outsider in York. When I called about moving into the apartment in my friend’s house, the owner asked me to meet her at the mall. We had a cup of coffee, discussed the rent and my desire to paint the rooms, and made a deal. The landlady asked “Are you a teacher or a nurse?” I explained about being an air pollution inspector, but I don’t remember her reaction. I knew (but I can’t say how), that the meeting over coffee had been a color check. I was a “desirable” tenant. Having watched the integration efforts in off campus housing at Michigan State, I was not surprised. York was a shabby industrial city, with all kinds of manufacturing mixed into the neighborhoods of apartments, row houses and slightly nicer homes. A cement factory loomed over West York, slowly turning it to stone. (Not kidding.) An iron foundry operated on the east side of town. A national corporation produced sports equipment and 500 pound bombs just north of the city. (Again, not kidding.) A smelly old factory turned out asphalt roofing. What else? Potato chips, and (!) York Mints. Yes, you can still buy them. Where are they made today? In all, about 1000 industrial sources operated in my working territory. A few dozen qualified as major pollutors. For me, every day was an adventure. I drove around York, Adams and Franklin counties, occasionally striking fear into polluters, who didn’t take their air pollution issues very seriously, and who hated being challenged by a young, female college graduate. I was ignored until the first “certified nastygram” arrived in a corporate office, threatening legal action. At most, fines of around $100 were levied, but business owners HATED to pay up. The federal government was in the process of taking over or at least regulating occupational health and safety, and environmental protection. These were big, important changes with significant consequences. I observed that the factories I inspected were rather dangerous places. 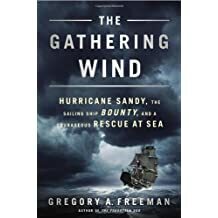 This book has an extensive subtitle: Hurricane Sandy, the sailing ship Bounty, and a courageous rescue at sea. The subtitle craze is out of hand. I’ve read several books about the sinking of Bounty, a tall ship originally built in 1960 by MGM as a movie prop. MGM originally intended to burn the ship after filming Mutiny on the Bounty, but Marlon Brando protested and the ship became a tourist attraction. Many movie goers admired Bounty in the 1989 movie Treasure Island starring Charlton Heston. Bounty sank on October 2012 during Hurricane Sandy. The captain and one crew member died. The remaining crew members were rescued by the US Coast Guard. Details are widely available. One thing that is perfectly evident is that Hurricane Sandy had been predicted clearly and well in advance. No ship needed to be close to that large and violent storm, and in fact Bounty was alone on the ocean when it was destroyed. The starting place for investigation and analysis is the assumption that (in recognition of the hazards of ocean travel) the captain always bears ALL responsibility for the ship. Captain Robin Walbridge had an excellent reputation and many years experience on sailing ships, but due to his death, the crew and owner of Bounty (and selected experts) would be the voices heard during the investigation. To the surprise of all concerned, Bounty owner Robert Hansen withdrew from the process, citing his Fifth Amendment right to remain silent. The question of whether he pressured Captain Walbridge to sail under unsafe conditions because he wanted the ship available to a prospective buyer at an event scheduled in Florida was never answered. With this failure of process, the Bounty investigation was stymied. Freeman discusses in detail what happened subsequently in the “court of public opinion”. Many people and organizations had a stake in the loss of Bounty. Most grievously harmed were the parents of deceased crew member Claudene Christian. Freeman includes in full a Facebook jeremiad posted by Jan Miles, Captain of the tall ship Pride of Baltimore II (and long term friend of Walbridge) in which he excoriates Walbridge for taking Bounty to sea in the face of Hurricane Sandy. He points out how the crew could have survived if Walbridge had taken shelter in Baltimore Harbor or even had deliberately run aground in the Chesapeake or Delaware estuaries. Jan Miles’s document is a heartfelt cry of pain, anger and disbelief. Freeman’s book provides a useful case study for a number of subjects: the psychology of leadership and decision making, regulatory development, history of marine architecture and so forth. Or if you want a good adventure story, read it!